Hi! We hope you had a very merry Christmas and that your holidays are continuing to be happy and bright! Here are a few projects I've worked on over the last few weeks! I was in Wal-mart a while ago and found corny women's knee socks in the holiday apparel section. 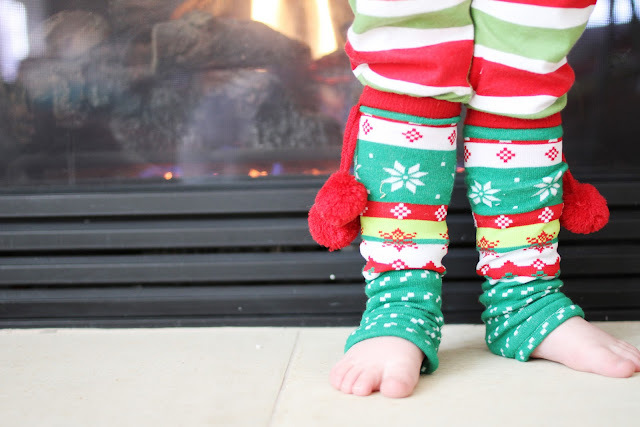 Corny for me to wear, but turn them into leg warmers for my little girls and corny becomes instantly cute! And as a bonus, I turned the leftover foot into ankle footies for myself! And those corny knee socks only cost me $2.75! All I did was cut the socks at the ankles. Then setting the footie part aside, I hemmed the bottom raw edge of the long socks to turn them into leg warmers! So easy! Indee has already worn them to a few different Christmas parties! Then I sewed just below the raw edge of the ankle sock to reinforce it, letting the top roll naturally. Yay for easy ankle footies! Now for the next project! My very handy and talented husband built a "Man Cave" out of sea containers behind his office building several months ago! 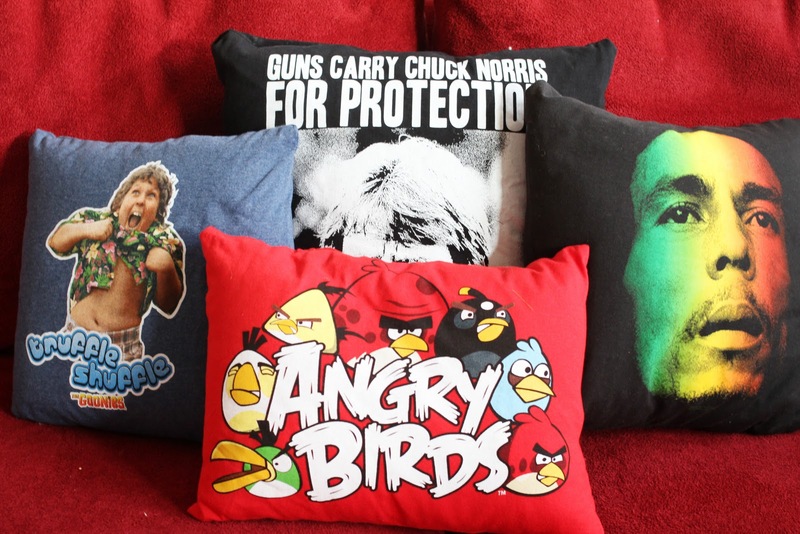 So, for Christmas I decided to make him a few "man" pillows to adorn his "man" couch in his "man" cave! I got the idea from one of my favorite sewing blogs Ruffles and Stuff! I bought a few t-shirts online, went to Joanns to get the right size pillow forms for each t-shirt and then turned the t-shirts into envelope style pillow covers! It was so easy! And I need to give a huge thanks to Bri who stayed up late helping me finish them! It was so fun actually! She and I brought our sewing machines down to our parents and we had a "sew" day (and night:) while the kids played! Disney from Ruffles and Stuff's tutorial is different from how I did mine because I wanted to be able to take the pillow covers off to launder them when needed. So here is a simple envelope pillow tutorial. Here are a couple of the finished t-shirt pillows! Cool projects! I really need to learn to sew! I'm dying to know more about the man cave - do you mean those giant metal shipping containers? If so, I HAVE to see that - how awesome!